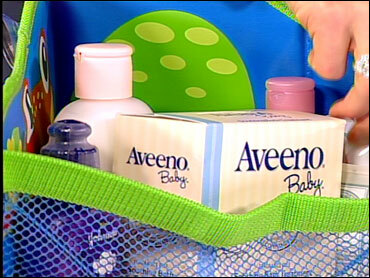 Winter can be hard on anyone's skin, especially if you're a newborn baby. Jessica Hartshorn, Sr. Lifestyle's Editor of American Baby Magazine, has some suggestions for keeping baby's skin soft and supple this winter. First, remember that just because it's cold outside doesn't mean you should overdress your baby. "I think new parents get a little freaked out about the cold temperature, so even if they're just going out for a short walk, they'll put their baby in a romper, and then a sweater, and then a jacket, and then they slide them into the little bundle me on the stroller and put a blanket over that..." says Hartshorn. "They only need one more layer than you're wearing." So, if you're comfortable going out in a sweater and a jacket, dress baby the same way, plus one. Throw a blanket over their stroller and they'll be just fine. Pay special attention to your baby's comfort at night. "Overheating at night is more of a serious issue," says Hartshorn. "It doesn't just cause a rash, it can make it hard for the baby to breathe." Instead of covering your baby with a blanket, which can pose a suffocation risk as well, try dressing your baby in footed pajamas or a wearable blanket. These blankets, which have a zipper up the front and arm holes, allow free movement, but keep baby just warm enough so that he or she doesn't overheat. Many babies get rashes in the winter, and they often pop up if the baby is overheated. In the summer, letting your baby run around naked for a bit will help. In the winter, however, you don't have this option because it's too cold. When the air gets chilly, Hartshorn suggests, "A nice warm bath in just plain water, or something with a real mild baby wash." Using an oatmeal-based formula will help take the itch away. After they're warm and dry, apply a petroleum-based cream on the affected area. This acts as a barrier against the elements and helps the rash to heal. Babies are also faced with chapped lips and faces in the winter. With their little nose running and their mouth drooling, a child's face is both cold and wet, which can accelerate chapping. In addition to wiping their face often with a clean tissue or cloth, try applying a little diaper rash cream. This, while a little surprising, helps heal the chapped lips and face and prevents future chapping as well. For more information on keeping your baby warm and healthy during the winter, or to visit American Baby's website, here.